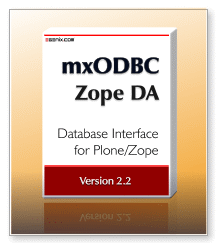 Connect your Zope/Plone installation to all ODBC compliant databases and data sources in a hassle-free, robust and scalable way... with our new mxODBC Zope Database Adapter™ for Zope and Plone. Even though we don't officially support using mxODBC Zope DA 2.0 with Plone 4.1 and Zope 2.13, we have successfully tested the setup when using the special installation instructions given below. Compatible with all recent Zope and Python releases: Supports Zope 2.10.9+, 2.11.4+, 2.12.x and is compatible with 2.13.x; supports Python 2.4, 2.5 and 2.6. If you need support for older Zope releases, please use version 1.0.10 of our mxODBC Zope DA. Compatible with Plone 3.2 - 4.1: The zc.buildout compatible installation process allows easy integration with your existing Plone 3.2 - 4.1 installations. If you'd like to upgrade licenses purchased for version 1.0 of the mxODBC Zope DA, we offer 40% discounts on the version 2.0 price for purchases of mxODBC Zope DA 1.0 licenses made since 2010-01-01 and 20% discounts for purchases made between 2009-06-01 and 2009-12-31. This offer is time limited until 2010-09-30. We have successfully tested the Zope DA with iODBC 3.52.7 and unixODBC 2.3.0. For unixODBC 2.3.1 and later please create a symlink from libodbc.so.2 to libodbc.so.1 as mentioned on the unixODBC news section.